The earliest operas were not operas at all, but music theatre entertainments. This new disc from Raphael Pichon and Pygmalion, Stravaganza d'Amore! 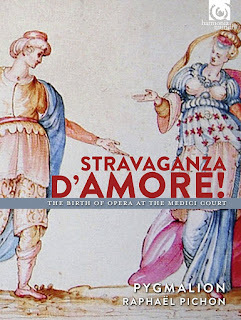 on Harmonia Mundi, aims to re-capture some of the excitement of the earliest days of opera at the Medici court in Florence. Rather than play a disc of excerpts, Pichon has created a series of Intermedi made from music by composers who created the earliest operas. Opera in Florence had its origins in the experiments by the Florentine Camerata in modern styles such as monody, combined with the Florentine court's taste for elaborate musical spectacle, often involving the same composers and librettists from the Florentine Camerata. An important milestone was the Florentine Intermedi of 1589, music theatre interludes written to go between the acts of play, Le Pellegrina for the marriage celebrations of Ferdinand de Medici and Christina of Lorraine. Dramatically, musically and scenically sophisticated, these Intermedi were such a success that they were repeated without the play. The first attempt at opera seems to have been Jacopo Peri's La Dafne in 1596/97. By 1600 at the wedding of Maria de Medici and King Henri IV of France, the celebrations included two fully sung dramatic entertainments, some of the first operas, Il rapimento di Cefalo by Giulio Caccini and others, and L'Euridice by Jacopo Peri. 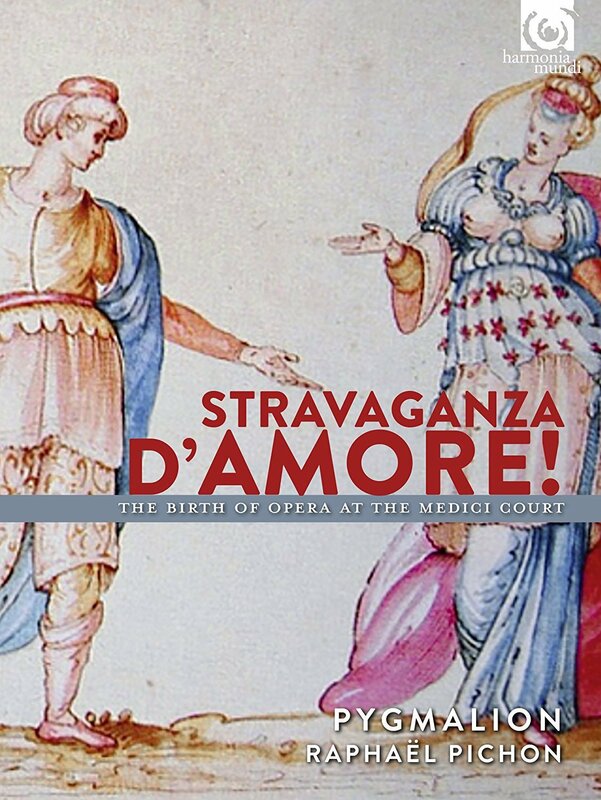 Only fragments of Dafne and Cefalo survive, so what we have here are newly created Intermedi - 'All'imperio d'Amore', 'La Favolla d'Apollo', 'Le Lagrime d'Orfeo', 'Il Ballo degli reali amanti' - weaving music from all these early operas and intermedi forming a delightful pot-pourri. A more didactic approach, such as scenes in chronological order, might have been more satisfying intellectually but Pichon has gone for a more creative approach, re-constituting fragments into a new whole. The standard of performance is very high, with some notable solo moments. The recording was made in the Chapelle Royale at Versailles and whilst the solo moments are beautifully in focus, the larger scale choral and instrumental passages are surrounded by a significant acoustic aura which may not be to everyone's taste. The two CDs are accompanied by an excellent multi-lingual book with informative essays and lots of pictures, along with a fascinating chronology. We are very unlikely to be able to recreate the real excitement of the Florentine musical hothouse, of 1589-1611 but this gives us a selection in approachable form and fine performances. Music by Lorenzo Allegri, Antonio Brunelli, Giovanni Battista Bunamente, Giulio Caccini, Emilio de' Cavalieri, Girolamo Fantini, Marco da Gagliano, Cristofano Malvezzi, Luca Marenzio, Alessandro Orologio, Jacopo Peri, Alessandro Striggio.